Another “plein Air” oil painting of the Villa as seen on my hike back from grocery shopping in the little village of Ponte agli Stolli…a good rough walk thru the hills on a path created by horses, men, and wild boar.Also on exhibit at the above. 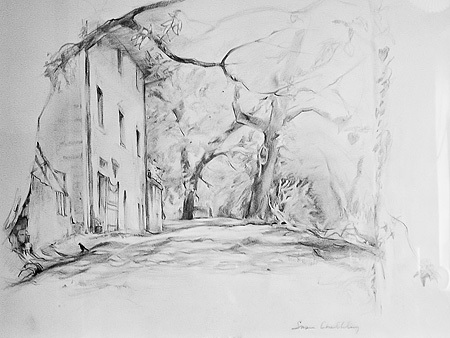 This is a pencil drawing I did sitting almost in the middle of the road that passes in front of the studio..I really like the trees that surround it and love to draw (anything) them so here it is…the photo is a bit wierd..seems to have left out middle tones but you get the idea…maybe I’ll get better at this transposing photos onto pcs oneday. This as well is exhibited at the Palagina..It was done last summer (2011) and measures 35 cm x 45 cm, on Annigoni papaer. Not a quick watercolor but one done also over time at the half hour over weeks…this is done with sepia and orange inks, and watercolor…the vines are gone,they have been pruned after the coldest part of winter, leaving,let’s say, stumps with two or three hardy limbs readied to reboot in the spring. I also helped do the grape harvesting in these vineyards. Also on display at Palagina. …so spring does seem to be here and I can actually paint outside without getting a cold!